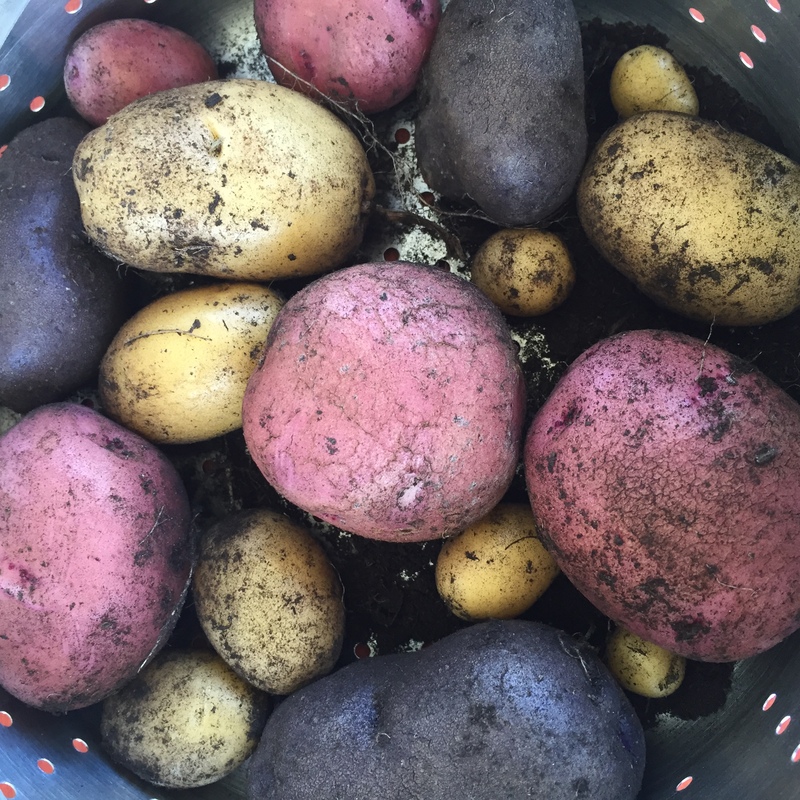 This year we decided to give homegrown potatoes a try. We purchased a couple of assorted seed potatoes from West Coast Seeds, along with a few potato bags to grow them in. I have to say that everything worked out really well! 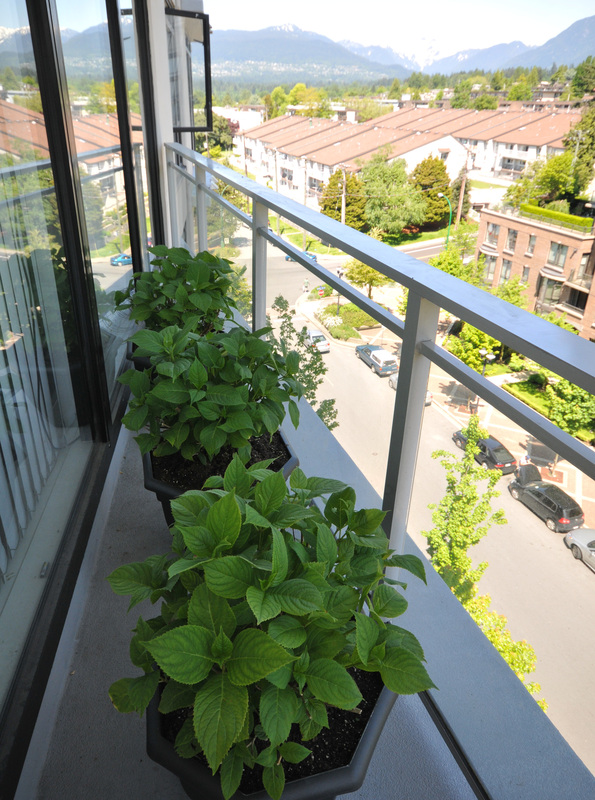 Growing the potatoes was very easy. 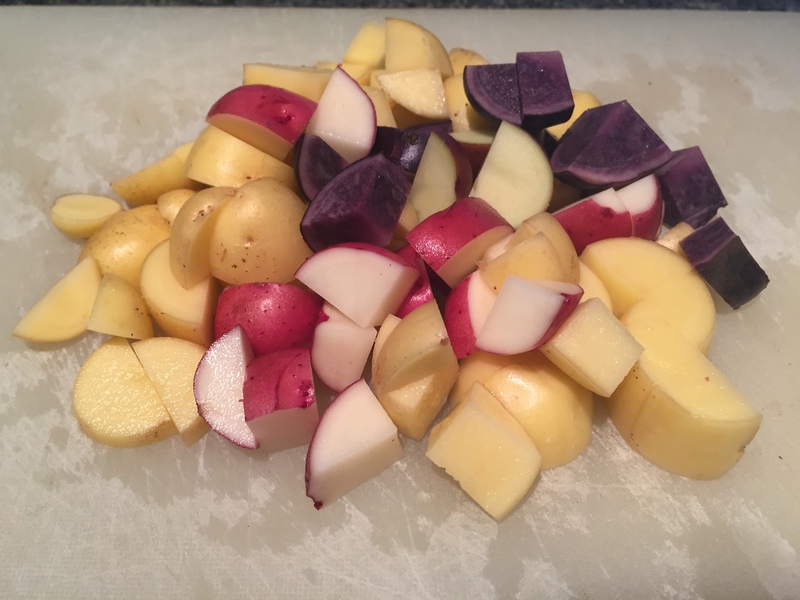 The seed potatoes we purchased were a tri-colour mix of yellow, red and purple, so we planted one of each colour in each potato bag. The neat thing about planting the tri-colour mix is that we could tell which plant was which by the colour of the stalks. 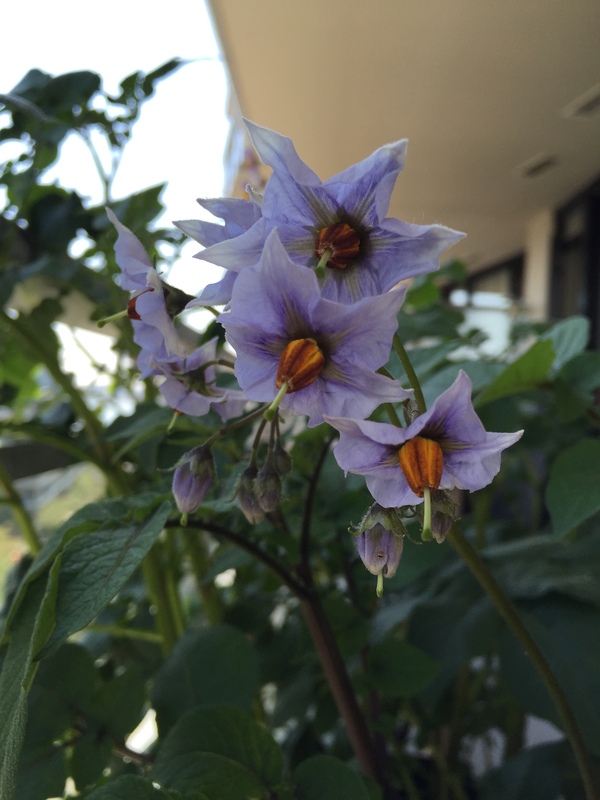 The purple potato plant had a deep purple stalk, while the red one had slight red streaks to it. 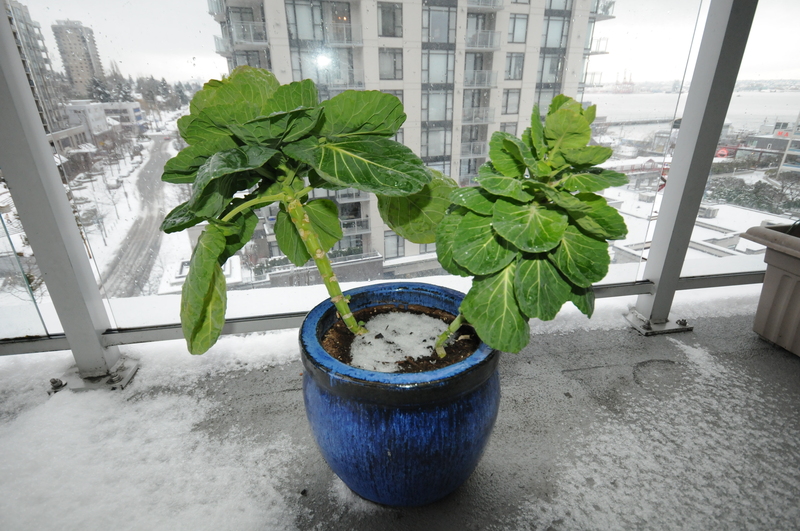 The yellow potato plant had a basic green stalk, but it was easy to spot when compared to the other two. 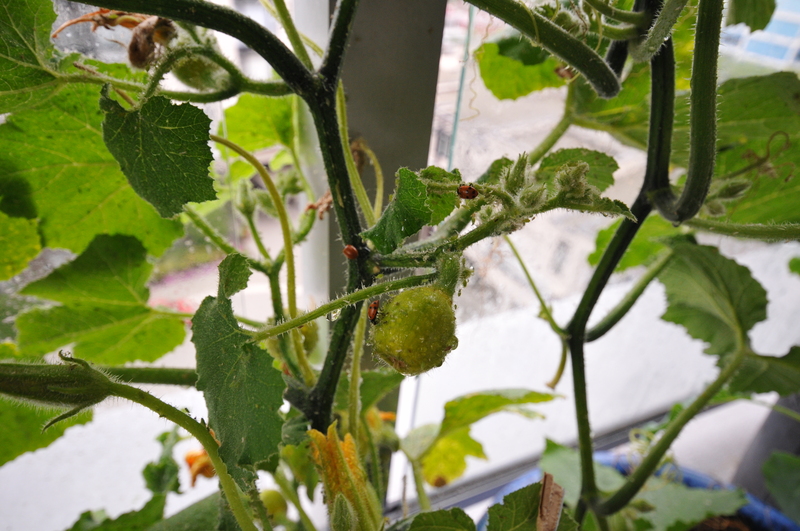 The plants grew very well in the growing bags, and eventually we had tiny purple flowers on top of all three types. 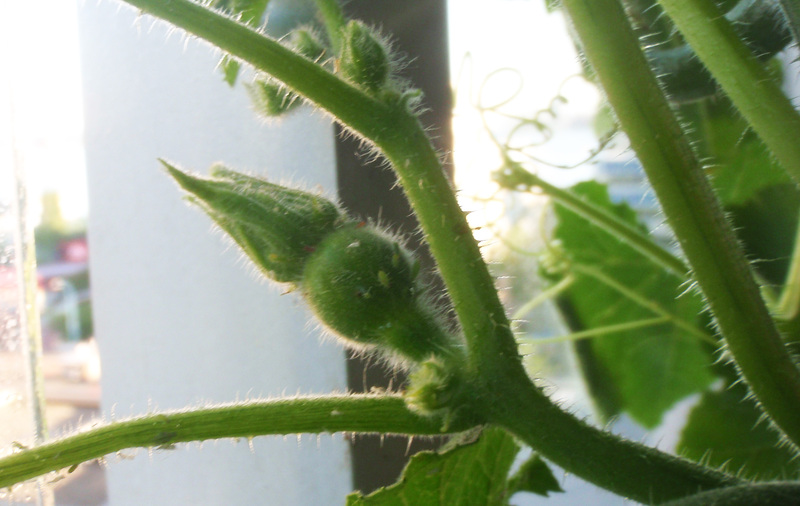 We even grew a few potato fruits, which look like tiny green tomatoes! 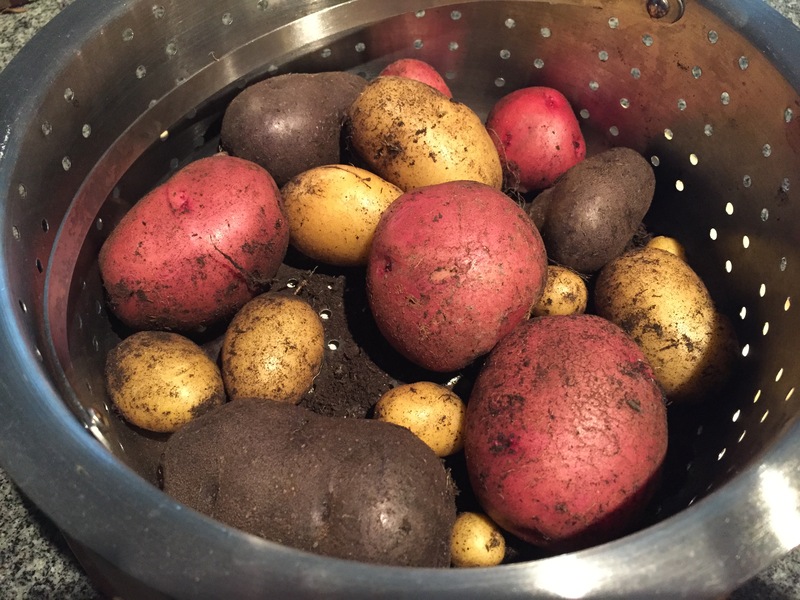 However, beware, because potato fruits are actually poisonous so make sure to pick them and throw them away (especially if you have little kids around who might be tempted to pick them, or mistake them for a tomato). 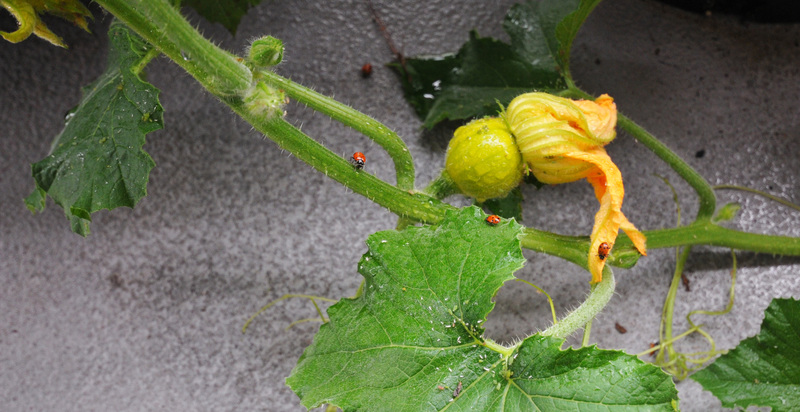 Since we only grew a small amount we planned to eat them fresh, instead of storing them long-term. 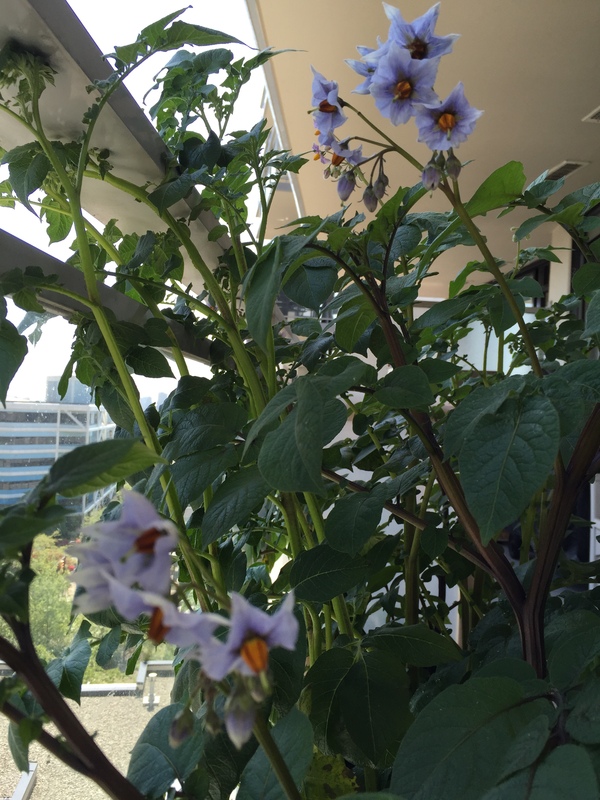 After the flowers died off and the plant stalks started to wither, the potatoes were ready to harvest. Voila! It was immensely satisfying cutting through these crisp, fresh potatoes with a sharp knife. It felt like cutting butter, or a soft piece of fruit. Once cooked, they were deliciously creamy too! Only one week has passed since my first post about our budding broccoli plants, and already they’re ready to harvest. I’m always a little sad when it comes time to chop my plants up, but I was also really looking forward to finally sampling some homegrown green goodness. 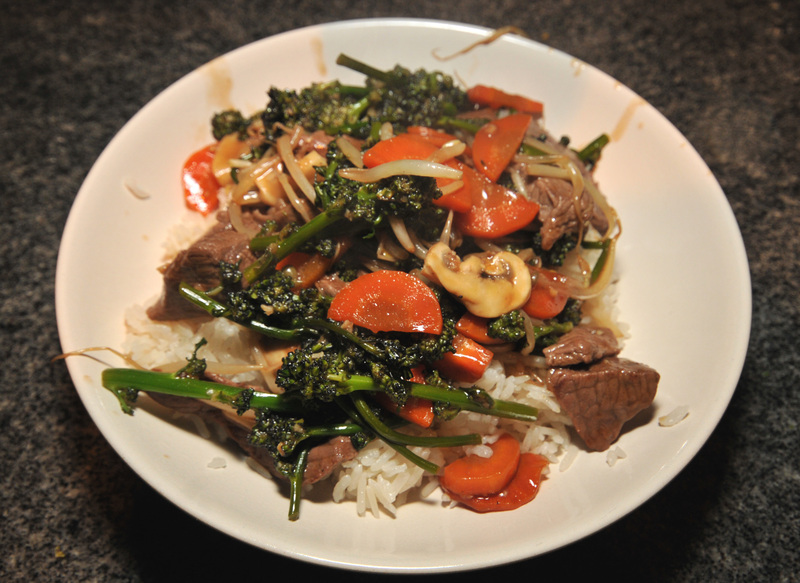 For our first harvest we decided to cook a beef and broccoli stir fry, one of our favourites. 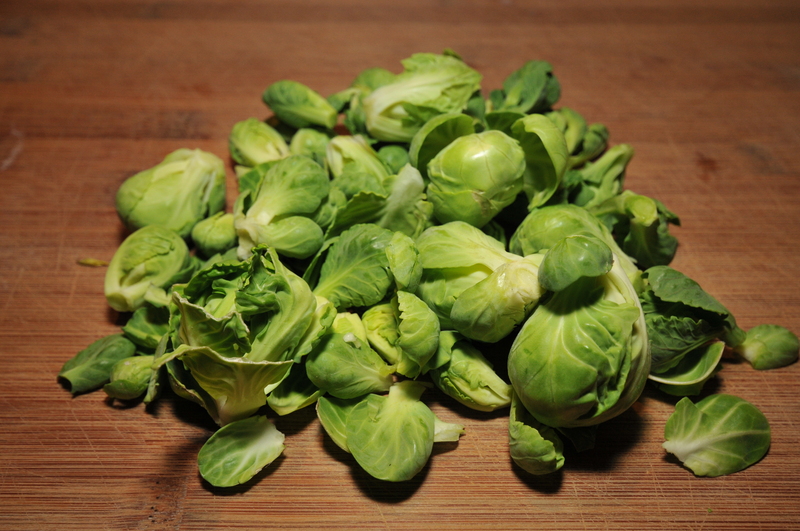 We sliced off four of the heartiest crowns and accompanying side shoots and piled them out on the cutting board. I hadn’t really realized just how much darker this homegrown broccoli was until I looked at it under our kitchen lights. The plants, true to their name, had very dark purple crowns, nothing like what we traditionally bought at the vegetable stand. The stalks of the florets were also much longer and thinner than all the store bought broccoli I’ve eaten. The crowns were not nearly as dense. Instead they felt light and delicate. 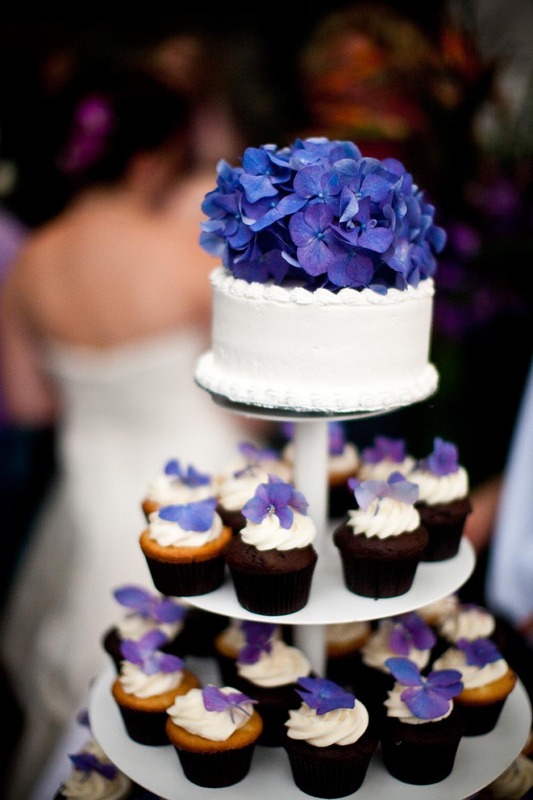 After we extracted all the edible bits off of the massive crowns we had one big purple pile! To accompany the broccoli we chopped up some carrots, mushrooms, and garlic and sliced two sirloin steaks as thin as we could manage. 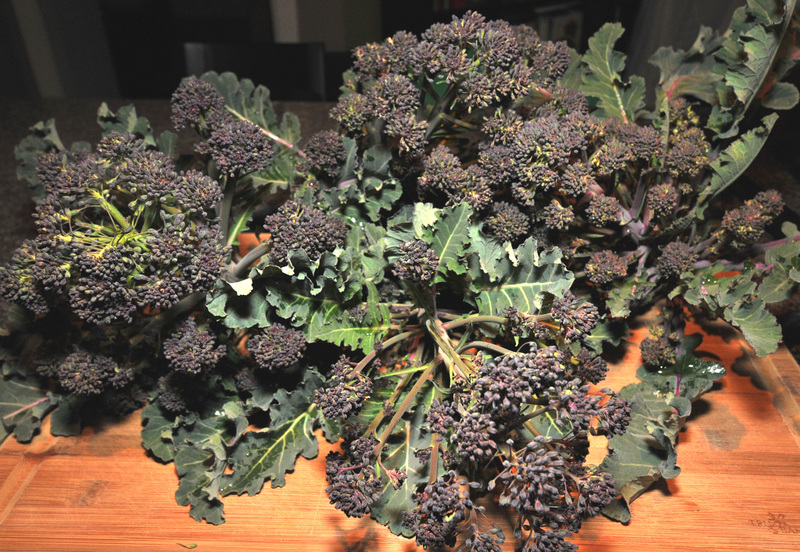 Since the broccoli florets were so much smaller and lighter than usual they cooked a lot faster. Once all the vegetables were cooked we added a cup of fresh bean sprouts, a cup of stir fry sauce and, voila! Our first home-grown broccoli feast was ready to eat. It was delicious! 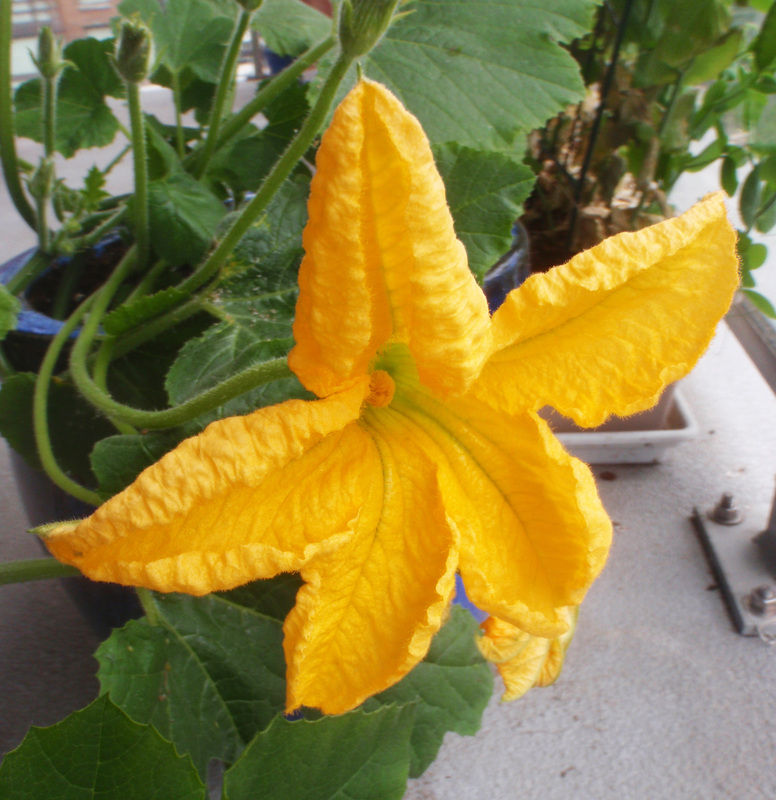 And more than that, it was satisfying to eat something that we’d been growing since August. 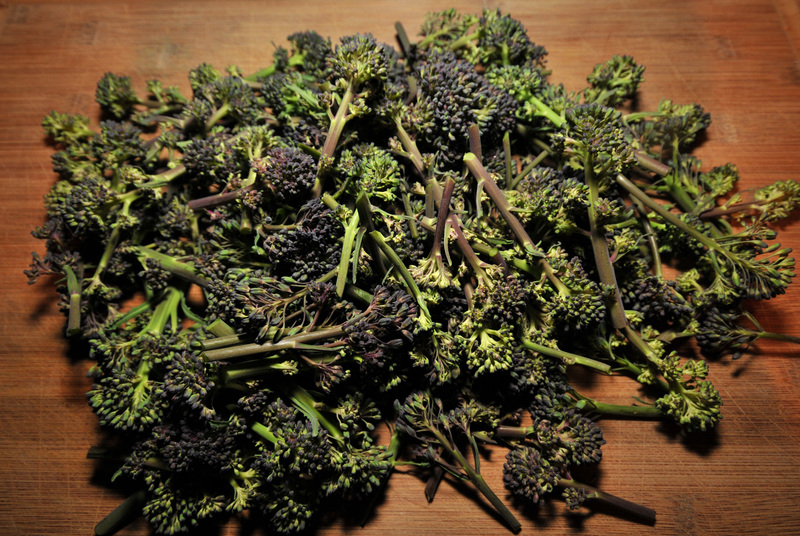 Next up, what broccoli dish should we cook for our second harvest? 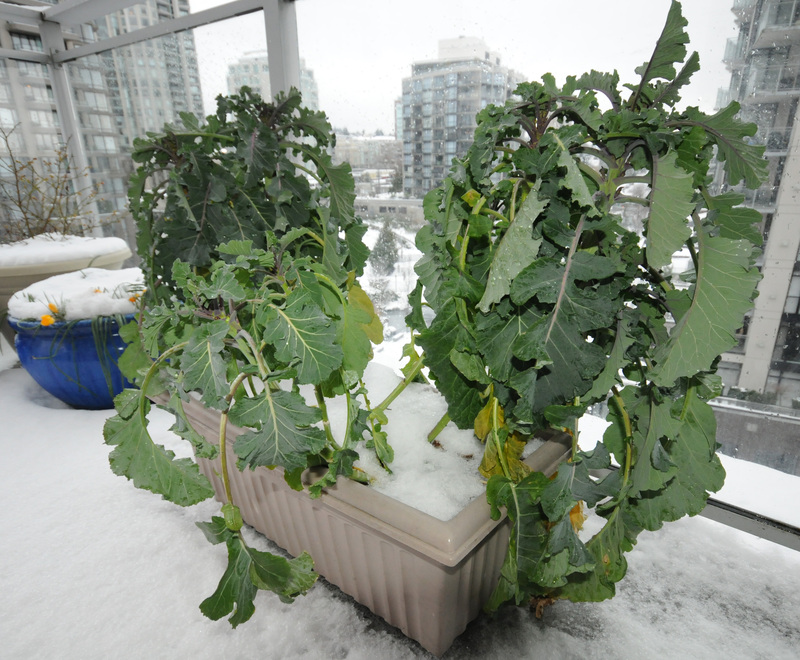 Some might say it’s overly ambitious to attempt to grow broccoli on a balcony with only partial sun. Some might say this, but not me. Nuts to that. 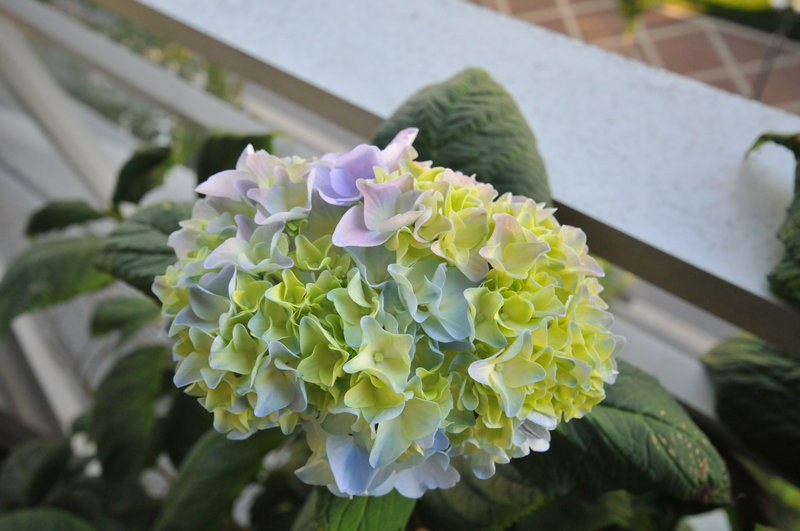 These extremely cold-hardy biennial plants grow over the winter months ready for early spring harvest. 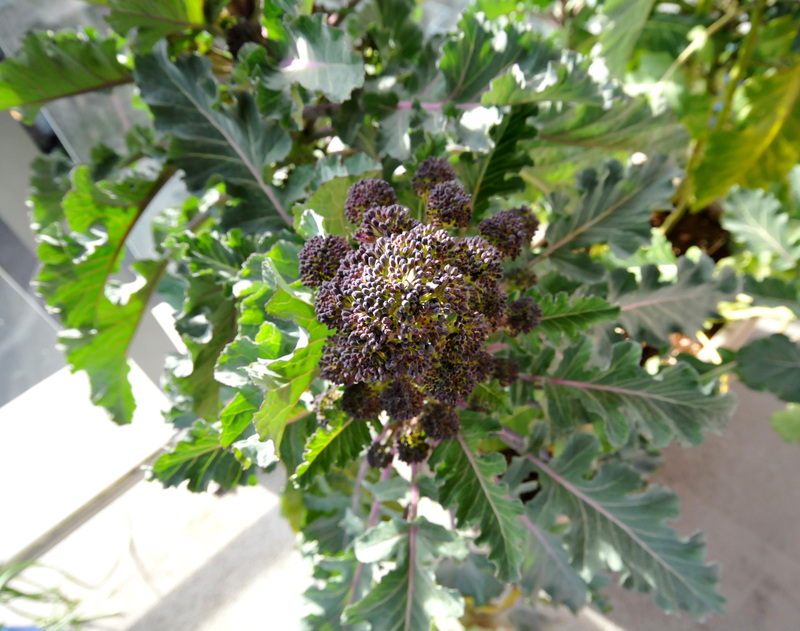 Purple sprouting broccoli provide very small, sweet purple flowering shoots in the spring. Sow in late summer for February to March harvest. 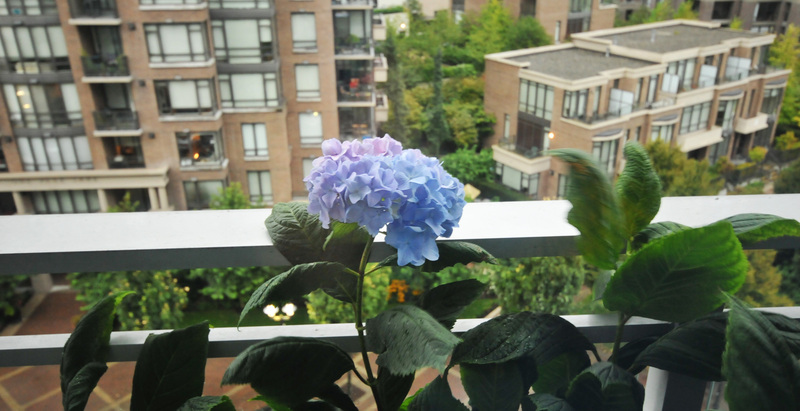 It was already late summer. Why not give it a shot? 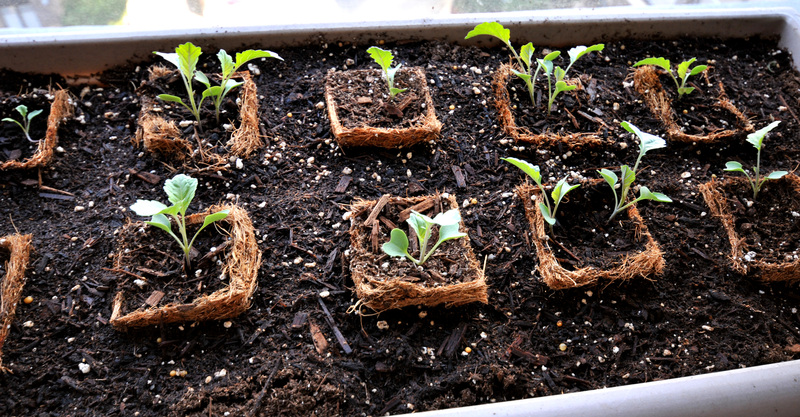 I began my mission by germinating and planting 10 seedling. 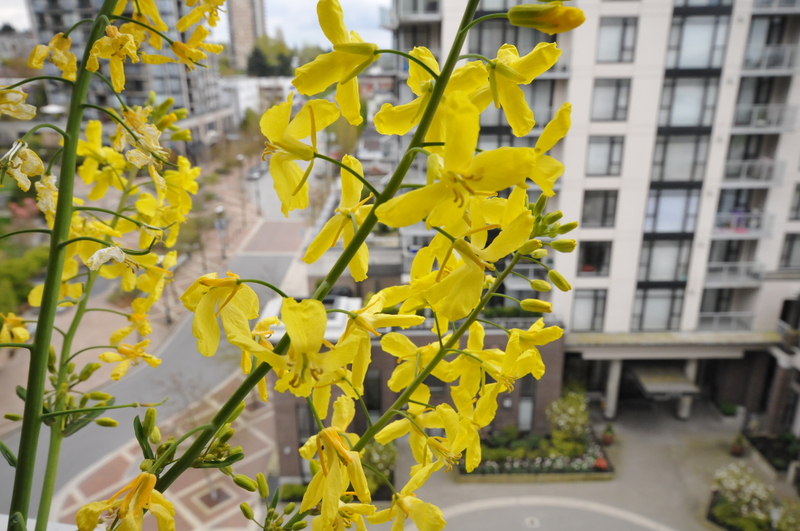 Over the next months the plants grew taller and leafier and broader, and several of the stalks turned yellow and died. I have a habit of overcrowding all of my pots, so I figured this probably wasn’t a bad thing. This was nature weeding out the weaklings for me. 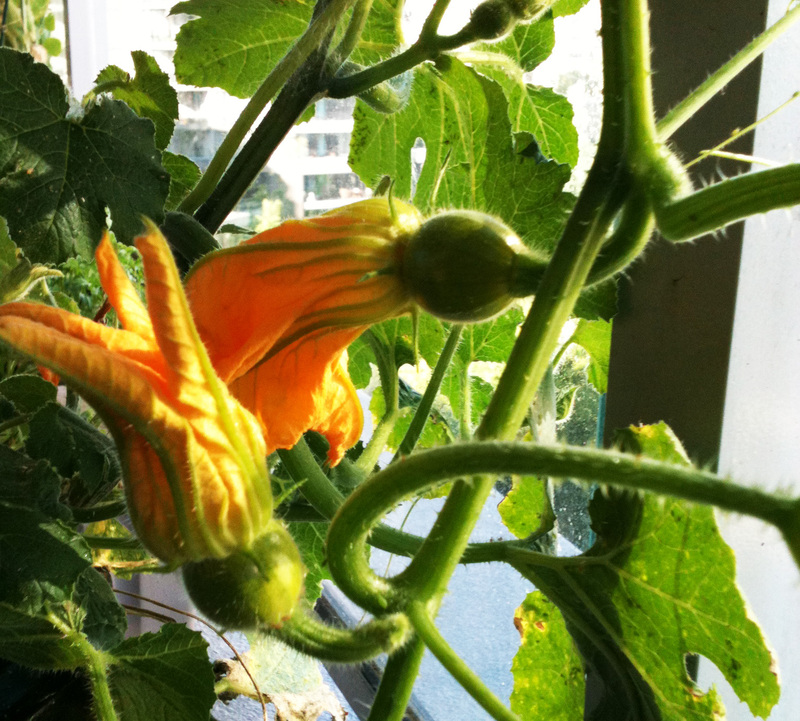 The plants got taller and broader still and by January my mind began to fill with questions: Had I started my seedlings too late? Or was it too cold, too dry, or too dark? 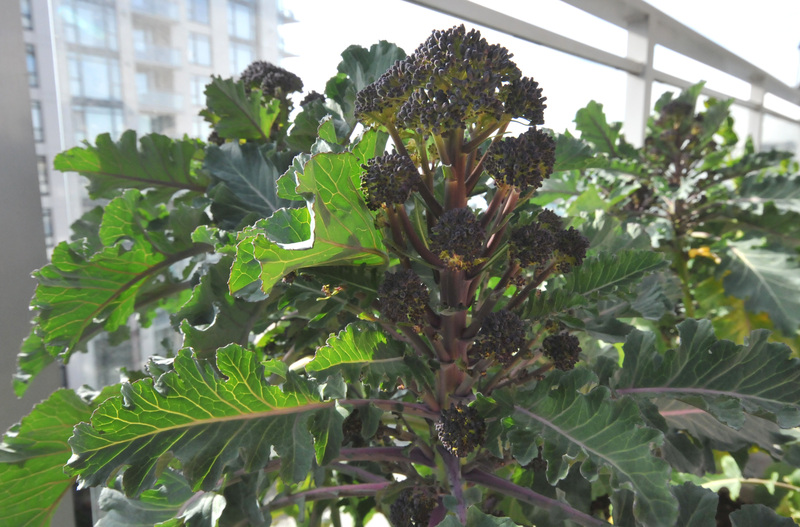 Would these plants ever produce any real, edible broccoli? 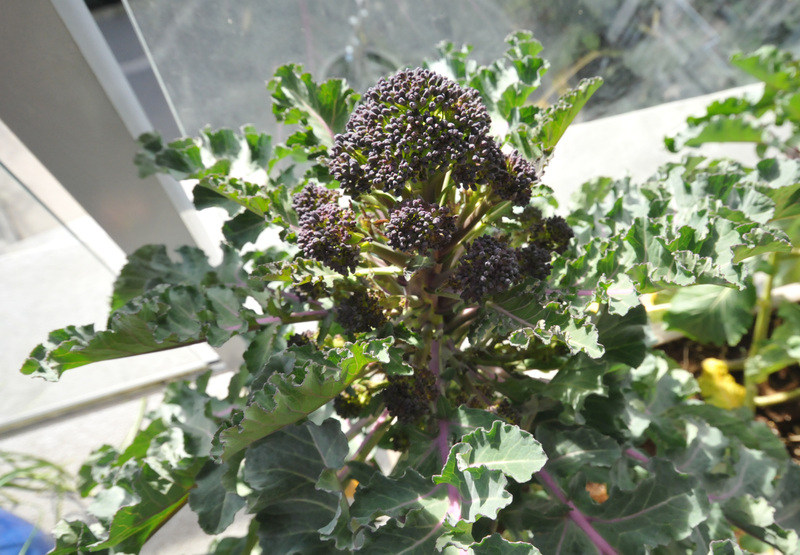 One month later I spotted the very first semblance of a broccoli crown at the apex of the biggest plant. Exciting! 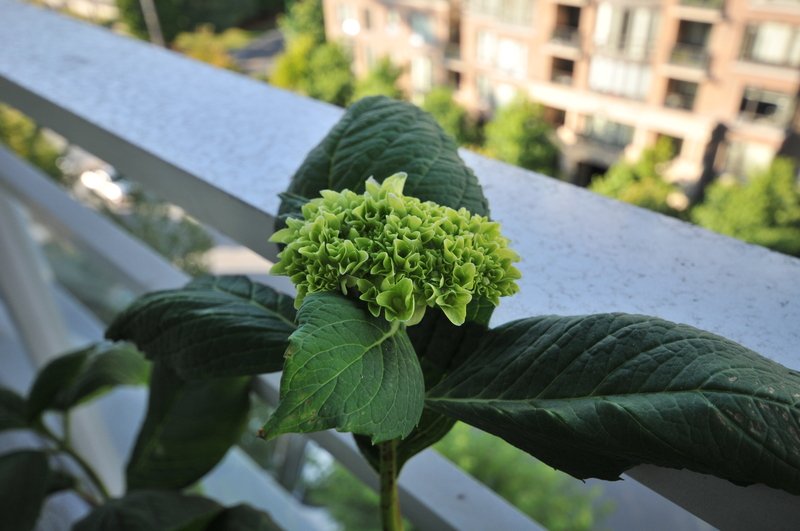 Now that it’s almost April, I’m astounded by the plant’s progress every day. 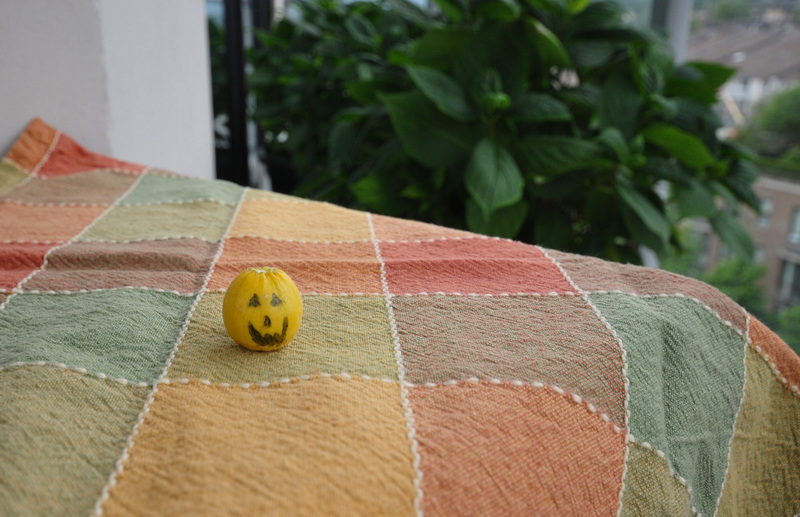 Though I’ve yet to taste this home-grown vegetable, I’m satisfied that my experiment has been a success. My only remaining question is, how will I know when the plant is ready to harvest? 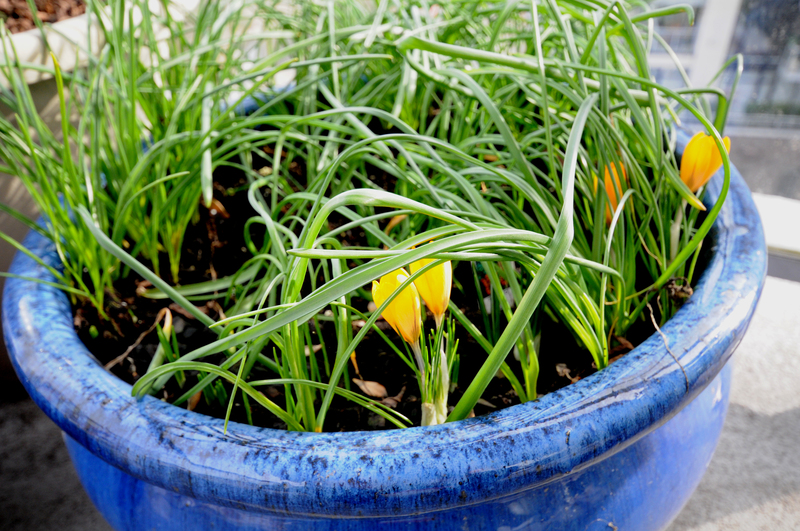 I’m always excited for the first bulbs to sprout on our deck. Seeing that first flash of colour in amongst all the green fronds makes my heart beat just a little bit faster. Why? Because I know my efforts weren’t wasted, and soon enough I’ll have pots and pots of colourful crocuses, daffodils, and hyacinths to enjoy. Spring is traditionally the most exciting time for gardening because of all the possibilities that fill up my imagination. It’s the time of the year when my gardening catalog arrives from West Coast Seeds and I go on and on to my husband about wanting more land so I could plant heaps and mounds of different vegetables, herbs and flowers. 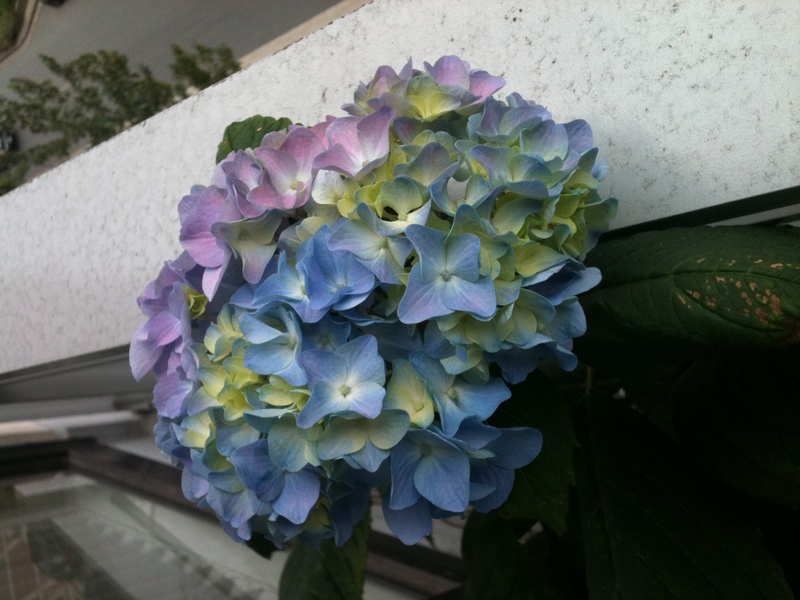 When it’s sunny out I get giddy with gardener’s delight, but this year has felt a little different than before. This year I didn’t stop gardening through the winter and I decided to do the winter vegetable thing to try something new. It’s been great fun so far, and even though not everything has gone according to plan, we’ll be dining on our winter veggies soon enough. 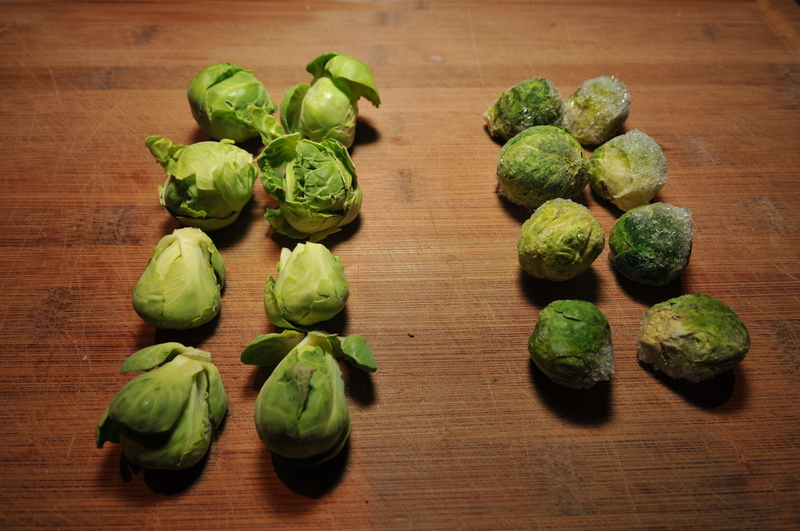 First up will be our brussel sprouts and then, hopefully, some home-grown broccoli. I’m still totally excited to begin another year of container gardening and all the possibilities at my fingertips, but this year I feel like I never stopped, and that feels satisfying in it’s own way too. It’s a bit too early to begin planting again, but for now I’m content to enjoy my spring bulbs as more open slowly day by day.